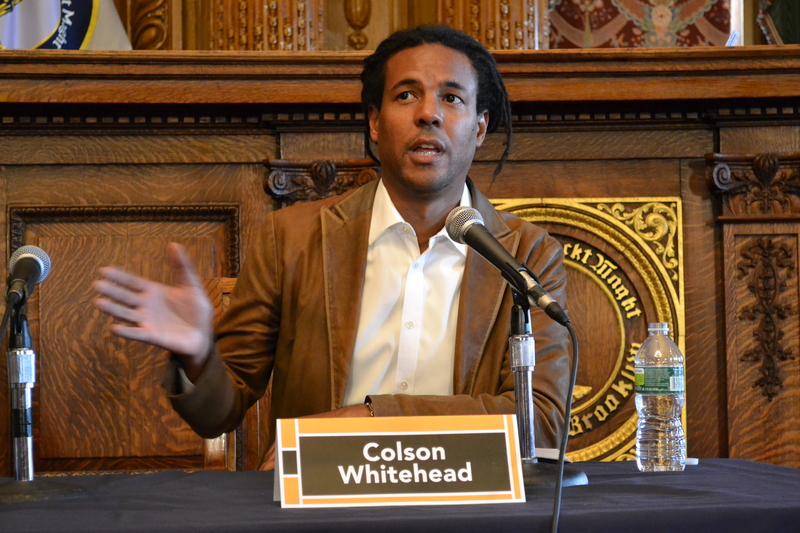 Colson Whitehead spoke at the Brooklyn Book Festival in 2011. Photo courtesy of Flickr. Colson Whitehead, a Pulitzer Prize-winning American novelist, will present tomorrow at the Schrott Center for the Arts as part of the Visiting Writers Series. Whitehead’s latest work, “The Underground Railroad” (2016), is a historical fiction novel about a young girl’s escape from slavery in the United States. It won the 2017 Pulitzer Prize, the National Book Award, the Carnegie Medal for Fiction and was a New York Times’ best-seller. He is the recipient of a MacArthur Fellowship, a Guggenheim Fellowship, a Whiting Award, the Dos Passos Prize and a fellowship at the Cullman Center for Scholars and Writers. Ania Spyra, an English professor and the prose coordinator for the Visiting Writers Series, said “The Underground Railroad” is the first novel in 20 years to receive both the Pulitzer Prize and the National Book Award. Although set in another time period, Spyra said the issue of racism the novel touches on is still relevant today. Schmidt too commented on the novel’s relevance to today and Whitehead’s ability to present a historical discussion in a captivating way. In addition to “The Underground Railroad,” Whitehead has written on a broad spectrum of topics, ranging from zombies to elevators in his other works. Some of his other novels include “John Henry Days” (2001), “Sag Harbor” (2009), and “Zone One” (2011). He has also written a collection of essays called “The Colossus of New York” (2003). Whitehead is the second of 12 writers that will visit campus this year. All Visiting Writers Series events are open and free to Butler students as well as the Indianapolis community. Whitehead’s presentation at 7:30 p.m. on Sept. 21 is sold-out. However, starting at 7:15 p.m., open seats will be released to those ticket-less individuals waiting in line at the Schrott Center for the Arts. For those students who attend, the event counts as a BCR credit. Earlier in the day on Thursday, there will be a Q&A with the author at the Efroymson Center for Creative Writing at 1 p.m. This event is free and open primarily to Butler students as well as Butler faculty and staff. A selection of Whitehead’s work is also available for purchase at the Butler Bookstore.